Luiz Hara aka The London Foodie was one of the first fellow bloggers I met shortly after launching Kavey Eats in spring 2009. I can no longer remember how we met but I do know that we built a friendship on that most important of bases – food! Born in Brazil to Brazilian-Japanese parents, Luiz moved to London at the age of 19, fully intending to return to Brazil once his studies were completed. But fate intervened, he met his partner and settled down in the UK instead. His family background gives him an amazing range of cuisines to draw from in his cooking. I went to some of his earliest Japanese supperclubs which were a delight, and also loved his Cooking Club, during which each guest took a turn to cook a dish to the evening’s theme, creating a multi-course extravaganza. I remember when Luiz decided to leave behind the world of finance and dedicate himself wholeheartedly to food, kicking off with a diploma course at the Cordon Bleu cooking school and including a stint learning more about traditional Japanese cooking in Tokyo. His supperclub has continued apace to become one of London’s best; places are highly sought after and sell out within moments of going on sale. Although the food is predominantly home-style Japanese, Luiz regularly adds touches of South American influence, not to mention techniques from classic French cuisine, providing a feast of dishes you would be hard-pushed to find anywhere else in London. 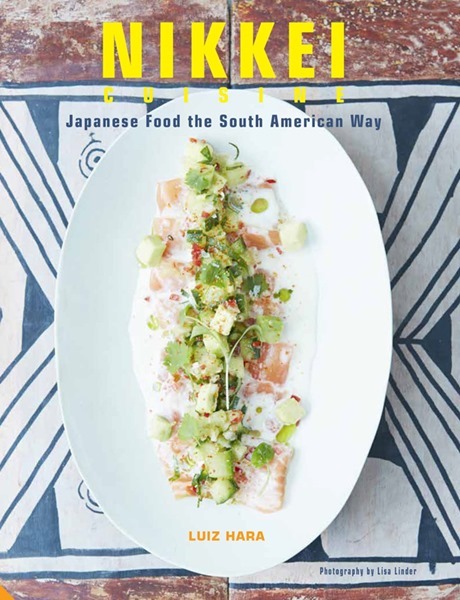 The good news is that his first cookbook, Nikkei Cuisine: Japanese Food the South American Way, shares many of the recipes he has developed and perfected over the last few years. At its simplest, Nikkei cuisine is the cooking of the Japanese diaspora. When my family and millions of other Japanese people migrated to South America at the start of the 20th century, they recreated their native cuisine using local ingredients. This style of Japanese cooking is known today as Nikkei Cuisine. For historical reasons, Nikkei cuisine is mostly associated with Peru and Brazil (where I was born). The book is his personal collection of over 100 recipes and includes family favourites and contributions from Japanese and Nikkei chefs he met during research trips, as well as the many recipes Luiz has developed himself. Recipes are divided into chapters for Small Eats; Sushi, Tiraditos & Ceviches (a chapter which really brings home the parallels between the South American and Japanese approach to raw fish); Rice & Noodles; Soups & Hotpots; Mains; Vegetables, Salads and Tofu and Desserts. There is also a chapter on mastering the basics of Sauces, Marinades & Condiments. Photographs are colourful and appealing, with handy step-by-step illustrations for trickier techniques such as Japanese rolled omelette and Maki (sushi) rolls. The good news is that I have two copies of Nikkei to give away. Scroll down for the chance to win this beautiful book. 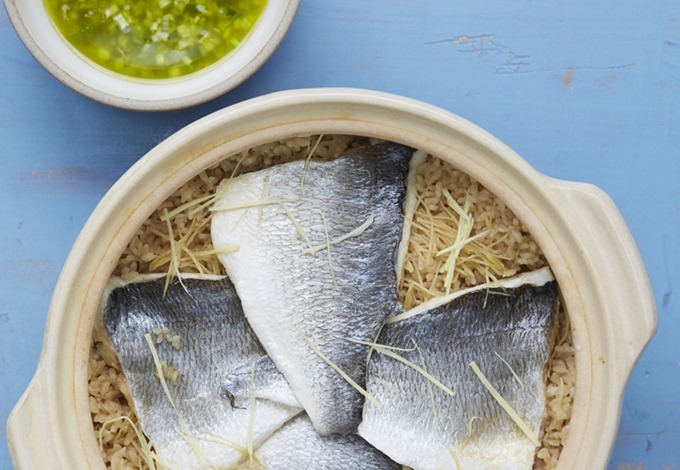 In the meantime, enjoy Luiz’ delicious recipe for Nikkei Sea Bream with Yuzu & Green Jalapeño Rice. 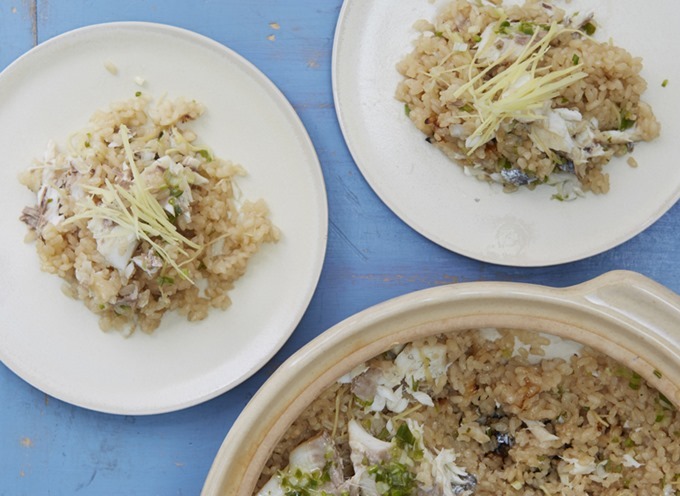 Tai gohan (sea-bream rice) is a classic of Japanese home cooking and is a dish I have always loved. It can be made in a rice cooker or in a clay pot or elegant pan to be served at the table for added wow. The fish is cooked over the rice, imparting a delicious flavour to the dish. Here I give my Nikkei interpretation, by adding a dressing of olive oil, yuzu juice and jalapeño green chillies, mixed into the rice just before serving. It’s like traditional Japan embracing the spice of South America. Wash the rice in a bowl with plenty of fresh water using a circular motion with your hand. Drain the water and repeat this rinsing three or four times until the water runs clear. Let the rice drain in a colander for at least 15 minutes. Meanwhile, prepare the soaking and cooking broth. Combine the dashi or water, mirin and light soy sauce and set aside. Soak the drained rice in the cooking broth in a clay pot or a rice cooker (see below) for 30 minutes. Rice cooker method: After the soaking and before cooking, scatter half of the ginger strips over the rice, lay the sea bream fillets on top and turn the rice cooker on. It should take about 15–20 minutes to cook. Once the rice cooker’s alarm beeps indicating that the rice is cooked, let the rice rest for at least 15 minutes before opening the rice cooker. Clay pot method: Tightly wrap a tea-towel (dish towel) over the lid of a Japanese clay pot (known as donabe) or if you do not have one you can use a heavy casserole pan (Dutch oven). After the soaking and before cooking, scatter half of the ginger strips over the rice, lay the sea bream fillets on the top (I like to arrange the fillets to look like an open flower), place the lid on top and bring to the boil. Once boiling, bring the temperature down to the lowest setting and cook for 15 minutes. Turn off the heat, and without opening the lid (don’t open the lid at any stage of the cooking process), rest for a further 15 minutes. Up to this stage, this rice is a traditional Japanese tai gohan or Japanese sea bream rice and can be served as it is – it will taste delicious. But for added va-va-voom, I like serving this with a yuzu and green jalapeño dressing, which I pour over the fish and rice just before serving. To make the dressing just put all the ingredients in a bowl and mix together well. Take the unopened clay pot to the table, open it in front of your guests and, if desired, carefully remove the skin of the fish. 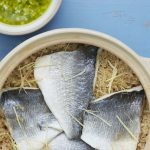 Pour the dressing over the fish and rice then using a wide wooden spoon, fluff the rice well, breaking the fish into tiny pieces and mixing it together with the dressing into the rice. Mix thoroughly. If you are using a rice cooker, follow all the above steps but do not take the rice cooker to the table! Make all the necessary preparations and serve the rice in individual bowls at the table. To serve, place the rice in individual rice bowls, top with the remaining julienned ginger in the centre of each bowl followed by a sprinkle of sansho pepper and serve immediately. Recipe and images extracted from Nikkei Cuisine: Japanese Food the South American Way by Luiz Hara. Photography by Lisa Linder. Kavey Eats received a review copy from Jacqui Small . Nikkei Cuisine is currently available from Amazon UK for £19.99 (RRP £25) (at time of posting). 27 Comments to "Luiz Hara’s Nikkei Sea Bream with Yuzu & Green Jalapeno Rice"
It’s funny, we’ve got so used to Japanese food over here, but I somehow just don’t associate it with the USA. Just realised my mistake, but South America is even more of my radar! this was possibly the best book I’ve had in the post this year! This sounds very intriguing. I love Japanese food and don’t know much about South American food – they sound unlikely partners but then again sometimes the unlikeliest fusions bring the most amazing results. My partner makes an amazing Japanese curry mmmm….. This looks like it is so nice, I will definetly give it a try with hubby, Our anniversary is coming up, might do it for then! I have been hearing about his supperclub but not yet been luck to make it to one. One day soon hopefully. This looks like a fantastic book and what a mouth watering recipe! I have a great fondness for Takoyaki & I even bought a Takoyaki pan to make it at home. I’ve followed The London Foodie blog for quite a while. The book sounds great. Apart from Luiz’s gorgeous cuisine (spaghetti with caviar anyone?) it’s got to be yellowtail tiradito from UNI restaurant in Victoria. Yummy! First time I tries sushi was in Los Angles visiting my old school friend. It was very different but strangely pleasant. I’m impsdrsee. You’ve really raised the bar with that. I’ve also heard so much about this book…one of these days I need to purchase it! Food has been such a comfort in the past little while! I must change my focus, but it is Hard!! !